The heads of Boeing and Lockheed Martin emerged from meetings with President-elect Trump vowing to rein in the costs of new Air Force Ones and the nation's premier fighter jet. Boeing CEO Dennis Muilenburg left the meeting at Trump's Mar-A-Lago estate Wednesday to say one topic had been the $4 billion price tag cited by Trump for two new Air Force One jets. Muilenburg said that Boeing will "get it done for less than that... We're going to make sure that he gets the best capability and that it's done affordably." He added, "I was able to give the president-elect my personal commitment on behalf of the Boeing Company." Trump later spoke to the press and said, "We had the chairman of Boeing...We're looking to cut tremendous amount of money off" the price of the new Air Force One planes. The meeting follows an attack by the president-elect on Boeing's Air Force One contract. In a December 6 tweet, Trump criticized the price of the deal, writing "costs are out of control, more than $4 billion. Cancel order!" It's not entirely clear where that $4 billion figure comes from. The Air Force has budgeted $2.9 billion for two new Air Force Ones through 2021. 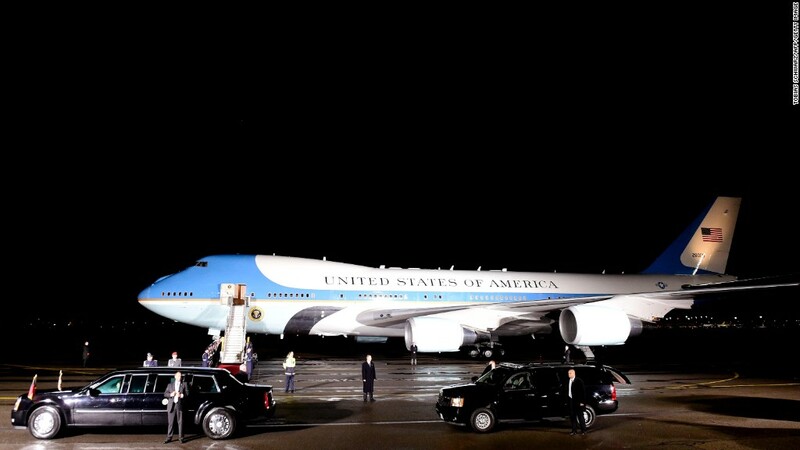 A Boeing source told CNN that it's difficult for the company to estimate the full cost of the program because "the Pentagon has not even decided all the bells and whistles it wants on the new Air Force One." Those bells and whistles would include state-of-the-art communication equipment and defense capabilities. The planes are not expected to be ready until 2022. Trump also met with Lockheed Martin CEO Marillyn Hewson, and said that their conversation focused in part on the F-35 fighter plane. Trump has complained about the price of the fighter, calling the costs "out of contol." The F-35 is the Pentagon's most expensive program, costing about $400 billion over the next few years. "Trying to get costs down... Primarily the F-35. We're trying to get the cost down," Trump said Wednesday. "It's a program that is very, very—uhhh—expensive." "Just beginning. It's a little bit of a dance. But we're going to get the cost down. We're going to get it done beautifully and these are great people," he said. Hewson later issued a statement calling the meeting "productive." "I conveyed our continued commitment to delivering an affordable aircraft to our U.S. military and our allies," Hewson said.